In her native Colombia Totó La Momposina is a cantadora, a diva. She is celebrated as a great singer and performer and, more than that, as a champion of Colombian culture. Born into the fourth generation of a family of musicians on the island of Mompos, off the Caribbean coast of Colombia, she grew up with various styles of Colombian folk and popular music, especially cumbia. As an adult, she has studied Colombian literature, dance and music, taught them, and dedicated herself to keeping them vital to the life of the country and to Colombians living abroad. Through her recordings and concerts, Totó La Momposina has become well-known to Europeans and North Americans as well. She made her international debut on stage at the World of Music and Dance Festival in Reading, England, in 1991, and since then she has performed at many festivals in Europe. She has toured North America several times, most recently in 2009, when she performed for standing-room-only crowds in New York, San Francisco, Los Angeles, and Miami. La Bodega is her eighth album. 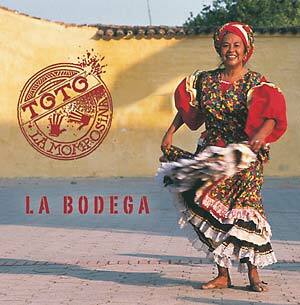 Like her previous albums, it is a beautifully integrated mix of traditional and new songs, sung in Totó's thrilling voice and accompanied by musicians playing a variety of horns, flutes, stringed instruments and percussion. "A cantadora is born with the gift of singing, the gift of summoning people," says Totó. "A cantadora belongs to the people." With La Bodega, she shares her gift with all people.